I was recently commissioned by Running Of The Bulls, Inc. – the United States’ largest tour operator to Pamplona for its annual Fiesta de San Fermín – to provide some information for their clients on the bulls themselves. The full written version is here, minus a series of specially filmed interviews I did for them around the world which are available only on their site, www.runningofthebulls.com. In it I discuss about a dozen ganaderías, ranches that breed bulls registered under Spanish law as being of the fighting bull ‘race’. However, there are many, many more. According to the Ministry of Culture’s latest figures, published Spring 2018, there are 1,329 ganaderas de reses de lidia, ‘breeders of fighting cattle’, in their registry. These supplied the past season’s 1,553 bullfights of all varieties. These include novilladas with novice matadors, rejoneo from horseback and full corridas in which 1,2 or 3 full matadors face 6 full-sized toros bravos, ‘brave bulls’, and various combinations of these types of event. These were serviced by the 10,959 licensed bullfighting professionals in Spain, 825 of them being matadors. And this is all alongside the 17,920 popular festivals involving cattle such as the encierros, ‘bull-runs’, for which Pamplona is famed. What to do in Seville aside from bullfighting: click here to read. It should be noted that the book has been some time in the making, and when I asked the Spanish Ambassador to the United Kingdom – I had given a speech for him on bullfighting to various notables including British Members of Parliament and Government Ministers, and he did this in return – for some words for the book, he in turn contacted the Ministry of Culture – who regulate the spectacle – who in turn contacted the President of Navarre, the autonomous community of which Pamplona is capital, who in turn contacted the Mayor’s office. The foreword I received back was during the term of office of Enrique Maya. However, given the official channels it came down, it is definitely a foreword by a serving Mayor of Pamplona, written as holder of office, not as private citizen or ex-Mayor. However, the current Mayor, Joseba Asirón, holds rather different views about the emblematic and iconic Bulls of Pamplona, as anti-taurine organisations like PETA have noted. 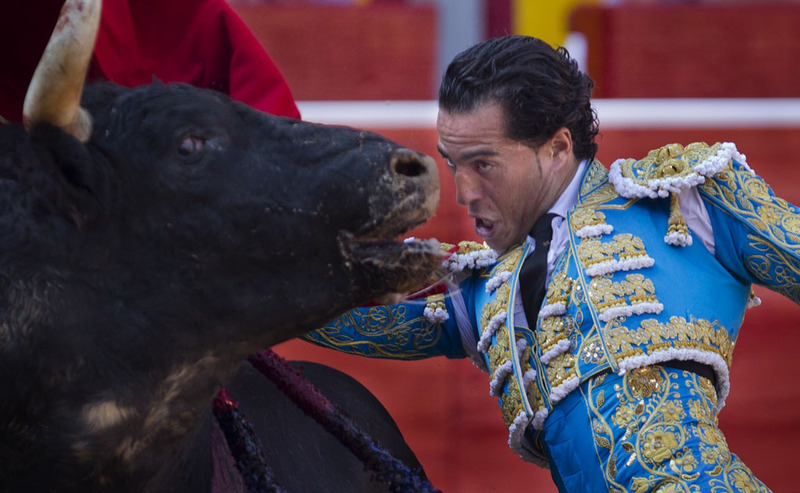 The 36-year-old Basque matador Iván Fandiño was killed by a bull in the ring yesterday in Aire-Sur-L’Adour, near Mont de Marsan, in the Nouvelle-Aquitaine region of southwestern France. The hierro, ‘iron’ or brand, of the ranch of Baltasar Ibán along with its colours. The bull, Provechito No. 53, was born in March 2013 in El Escorial in the province of Madrid, on the well-known as respect ranch of Baltasar Ibán – founded 1920 – whose herd is of the Contreras bloodline – whose origin is the historic Murubé line – with a touch of Domecq – whose origin is the historic Parladé line. It was the third of six bulls fought that evening, and was actually being fought by the matador Juan del Álamo when Fandiño stepped in to perform a quite upon it – a sequence of artistic manoeuvres with cape done after the bull has faced the mounted picador with his lance. This is not an uncommon occurrence in the centuries-old scripted sequence of a corrida. The corrida is not a sport, nor a fight (even though I use that English verb as “torear” has no proper translation) – nor thought of, discussed or reviewed in the papers as such. It is a tragic spectacle culminating in a ritual sacrifice. Fandiño had already been awarded an ear from his own bull, the first of the evening as most senior matador – he became a full matador in 2005 in Bilbao (he was the only Basque matador at the time of his death) – and clearly thought this bull special enough that he could do something to entertain, impress or move the audience with it.